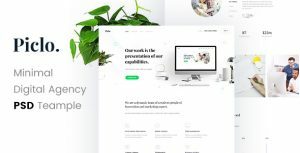 Teo is a clear-crisp modern single page template. Feeling sick of the usual? If so, you might have just found the cure. Teo comes in both Dark and Light version, make sure to check them both! – Extremely well organized and well named layers for easier use. Thanks to Athenastock for putting awesome work there.